In-Wall Power Connection Kit with Single Power and Cable Management for Wall Mounted HDTV Conceal cables and power for your wall mounted TV Introducing model ONE-CK in-wall power and cable management system. Single-Gang size all-in-one design. Designed to simplify wiring behind wall-mounted flat-panel TV's Pre assembled discreet system allows LowVage cables and wires to be routed through the wall for a clean look. Code Compliant to install power, includes hardware and helpful mounting template make the ONE-CK the perfect do-it-yourself solution for any skill level, without the need for an electrician. No wiring, simple snap together Power Connectors make this safe and easy. 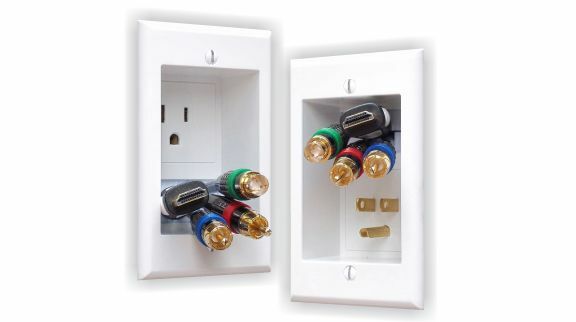 In-Wall Power Connection Kit with Single Power and Cable Management for Wall Mounted HDTV is rated 4.8 out of 5 by 37. Rated 5 out of 5 by Jack from Although this item is a bit pricey it worked well for my TV wall mount operation. Easy and straig... Although this item is a bit pricey it worked well for my TV wall mount operation. Easy and straight forward, and has a very nice finished look. Rated 5 out of 5 by JoeD from Ubelievably simple to install Unbelievably simple to install. This is a great product. Rated 5 out of 5 by Paul from This was simple to install and since I was looking for something Code Compliant I like it. This was simple to install and since I was looking for something Code Compliant I like it. Rated 5 out of 5 by RV from Instructions were clear. Product worked first time after I installed it and made the equipment co... Instructions were clear. Product worked first time after I installed it and made the equipment connections. Rated 5 out of 5 by HomeDepotCustomer from This product makes for a nice and simple DYI TV install. This product makes for a nice and simple DYI TV install. Rated 5 out of 5 by Mark from I can't express enough how simple this kit was to... I can't express enough how simple this kit was to install. It seems to be made of high quality material and looks like it was put in be a professional. Overall, definitely worth the investment! Rated 5 out of 5 by Paul from Super easy to install and it makes the area look... Super easy to install and it makes the area look extremely clean. I will be installing this for my other rooms. How many cables can be passed through? I ran the power cable and 3 HDMI no problem. Can this be used with a tv hung on the inside of an insulated exterior wall? Yes, that it where mine is installed with no issues!